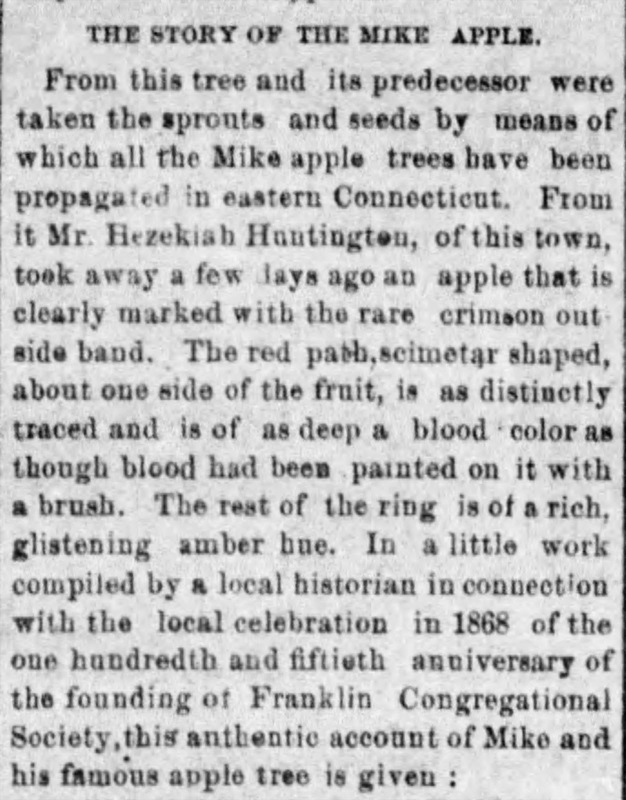 The advent of a quantity of "bloody-heart" apples into the Windham markets from the back country town of Franklin has resulted in the unearthing of an eerie tradition about this singular fruit, which has found its way into print. They are called the "Micah Rood apples," and are of a delicious flavor, snowy interior, and cherry-red skin. In every one there is a large red globule near the heart of the fruit resembling a drop of blood. This peculiarity has been made the subject of investigation, but no theory accounts for it as plausibly as the tradition of " Micah Rood's curse." 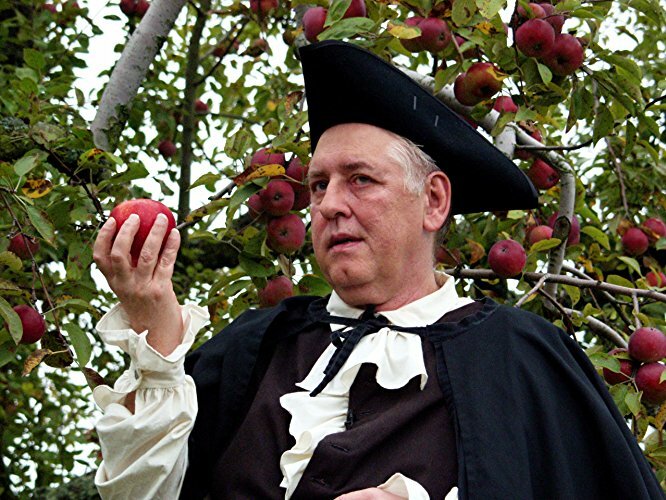 Micah Rood was a prosperous farmer at Franklin in 1693. He was avaricious, but finally became indolent, spending his time in dreaming over coveted wealth. One day a peddler, who carried a pack filled with valuable jewelry, passed his house. His dead body was found the next day beneath an apple tree on Micah's farm, where the latter was wont to sit. The skull was split open and the man's pack was rifled. Rood stoutly denied any knowledge of the crime, and, although suspicion attached itself to him, nothing was proved against him. He became morose and moody and never prospered afterward. People wagged their heads when on the autumn following the murder Rood's apple tree commenced to bear the "bloodyheart" apples. They said it was a silent judgment upon him, and that the dying peddler's curse upon the head of his destroyer had come home to roost upon Rood's apple tree. Nothing like the apples had ever been seen before. Either the apples or the Suspicion wore the life out of Rood, for he died soon after they appeared. 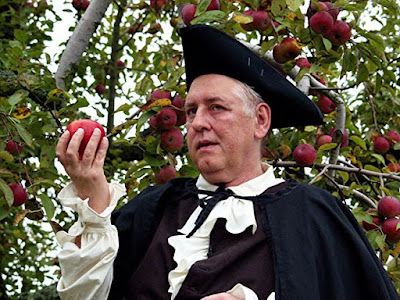 Ever since then the tree has lived, but it has almost ceased to bear the strange apples. It is the fruit from other grafted trees that revives the story to-day. July 5, 1727 two shillings per night and three shillings per day. 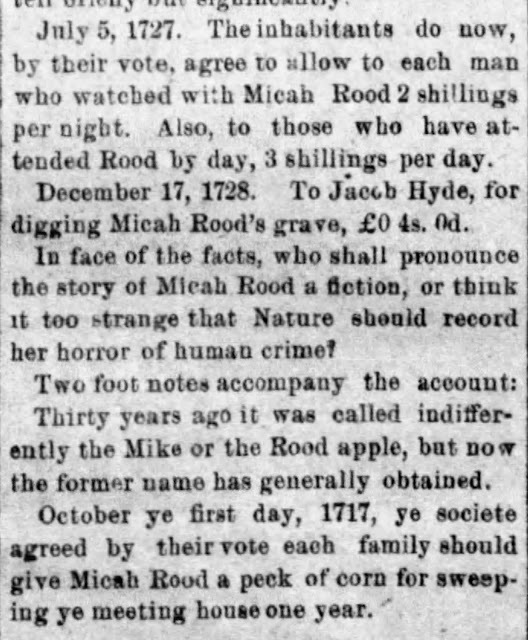 And on "December 17, 1728. to Jacob Hyde for digging Micah Rood's grave, 4 s."
Major General Orlando Bolivar Willcox (1823-1907), son of Charles Willcox (1789-1827) and Almira Rood (1790-1870) boost he was descended from the Rood line of “strenuous Connecticut stock” in his published memoirs of the Civil War. 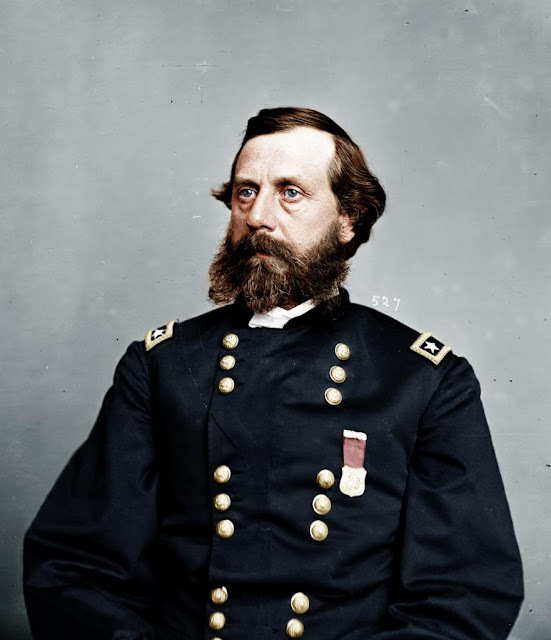 Orlando’s mother was a direct descendant of Captain John Griswold and Orlando’s brother Eben North Willcox was great-grandfather of famous actor Vincent Leonard Price who married Daisy Cobb Willcox, daughter of Henry Cole Willcox and Harriet Louise Cobb. There is more Rood drama coming and the old saying The proof is in the pudding and the apple doesn't fall far from the tree will certainly show this! Stay tuned!